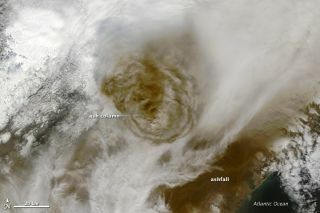 The MODIS instrument on NASA's Terra satellite captured this natural-color image of the Grimsvotn volcano eruption in Iceland on May 22, 2011 at 13:00 UTC (1:00 p.m. local time). The vast ash cloud spewing from Iceland's Grimvotn volcano is unmistakable from space in new photos snapped by NASA satellites. A wider view of the of the Grimsvotn volcano eruption in Iceland is featured in this non-annotated image from the MODIS instrument on NASA's Terra satellite captured this natural-color image on May 22, 2011 at 13:00 UTC (1:00 p.m. local time). The Grimvotn volcano began erupting Saturday at 5:30 p.m. local time on May 21. The next day, NASA's Aqua satellite spotted the eruption at about 5 a.m. local time, showing the volcano plume as a huge, dark blemish at the center of a field of white clouds. Eight hours later, NASA's Terra satellite caught a natural color view of the volcano from orbit. That image, recorded at about 1 p.m. local time, revealed the Grimvotn plume as a vast cauldron of hot ash and steam. In the Terra image, the plume directly above the volcano summit towers over the surrounding clouds and is made up of a roughly circular cloud. Ash has rained down around surrounding regions, coating the snow-covered regions to the volcano's southeast in a dark brown gloom. The Grimvotn volcano's initial plume soared higher into the atmosphere than the Eyjafjallajokull eruption 14 months ago. Eyjafjallajokull belched so much ash into the sky that it shut down air traffic across much of Europe. But while Grimvotn's ash plume did reach higher than that of Eyjafjallajokull, the effects on air transportation are not expected to be as severe since the cloud was forecast to move towards the northeast, according to the Icelandic Meteorological Office. "In addition, the ash content was coarser and therefore less likely to remain airborne long enough to reach European airspace," NASA officials said in an image description. "Some volcanic ash models, however, suggested that Grimvotn's ash could interfere with flights in the United Kingdom and Ireland beginning on May 24." Iceland's largest airport Keflavik did close due to the plume, officials added. The Grimsvotn volcano ash plume casts a shadow to the west in this NASA image taken by the Aqua Earth-watching satellite. Large portions of the Grimvotn volcano lie beneath the Vatnajokull Glacier, so when the recent eruption did begin on May 21, it originated below the glacier. Such eruptions can cause "glacier outburst floods, or jokulhlaups," NASA officials explained. But a previous outburst flood from the region last year should make a large flood during the current eruption unlikely, according to the Icelandic Meteorological Office.